A large and very bright living room, with an open kitchen fully equipped and two dining area. The master bedroom has a queen size bed and a ensuite shower-room (no toilet). The bedroom n°2 has also a queen size bed. The bedroom n°3 has two single bed. There is also a bathroom with a toilet plus a separated toilet. Washer/dryer and dishwasher in the apartment. Our agency Pick a Flat is located 33 rue du Louvre 75002 Paris, 15min walk away from the residence. You can come there to drop off your luggage if the apartment is not ready yet or if you leaving after check-out. Great and central location! The residence is rue Meslay, in the North of Le Marais, with many restaurants and cafés nearby. 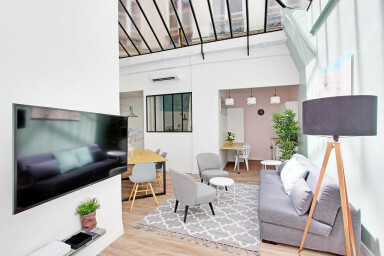 Few minutes walk away from République station, with great connections to the whole city.